Sebastian Silva's The Maid was a huge surprise, a funny and poignant drama about family, expectation and one woman's struggle to keep her job. The movie showcased Silva's dry sense of humour which may explain how he's ended up working with Michael Cera on not one but two films. 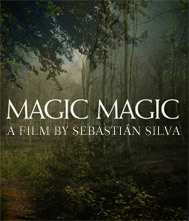 One of those is the Sundance title Magic Magic which was also selected for the Cannes Director's Fortnight. It stars Juno Temple as Alicia and Emily Browning as Sarah, best friends vacationing in Chile when Alicia begins to suffer from horrible visions. Sarah takes off on a personal adventure leaving Alicia with two strangers (Michael Cera and Sandino Moreno) just as her visions begin to worsen. From the look of the newly released trailer which focuses primarily on Alicia, the visions cause Alicia to become severely unstable and difficult and it looks like her antics begin to unravel not just her but everyone around her as well. Temple very talented and I don't doubt her performance here will be great; I'm more curious to see how Cera and Browning fare. Magic Magic has been picked up by Sony but doesn't yet have a release date.